In my mid-20s, I was living in a state of near-perpetual panic. In theory, I had everything going for me. I had freshly returned to Hong Kong, the city where I grew up, and I was running fast into a career as a writer. But I struggled with deadlines. Stress was a shadow that followed me everywhere I went. I would lie awake at night, the worries running like wolves around my mind. Then my health started to subtly implode. My hormones started to go out of whack. I first visited a Western doctor who pumped me full of strange hormones. Then I moved into a more holistic direction and went to a naturopath. She put me on a cleanse and suggested I try to drink less coffee, have fewer late nights out and think about starting a yoga or meditation practice. She told me I really needed to find a way to relax. But it’s hard for someone to tell you to relax and to stop all these toxic habits, when they’re the only things offering you release. I remember how I would stand in the stairwell during my long days working at the newspaper, chain-smoking and staring out at the waves of Victoria Harbor, wishing I could be many miles away. 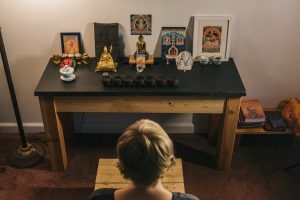 One day, I saw an advert for a course to be taught at a local Kadampa Buddhist center. When I arrived for the class, I walked up the stairwell to the top floor of an old Chinese building and found a radiant, light-filled room, a shrine with flowers and Buddha statues and about 30 people from all walks of life taking off their shoes. Out walked our teacher, a monk wrapped in maroon and saffron robes. He began the class by asking us to partially close our eyes, keep our backs straight and become aware of the breath entering and leaving our nostrils. He encouraged us to gently focus on that sensation. I remember in those first meditations feeling like I was in a boxing ring with Mike Tyson. I couldn’t keep my eyes shut; there was a cacophony going on in my mind. I would open my eyes, look around the room at everyone else looking calm, close my eyes and try again. I persevered, mainly because of the kindness and joy radiating from my teacher. He embodied a state of constant ease and happiness and just being in his presence brought the joy out of everyone around him. After the preliminary breathing meditation, Gen Kelsang Tonglam taught from a book. We were on an investigation into our minds. Where did the happiness and suffering actually come from? Was the stress coming from outside—or was it arising from within? In each class, Tonglam would lead us in a second meditation that showed us how to spot and disarm a negative state of mind, or a meditation that awoke a positive state of mind, encouraging us to gently hold that state with mindfulness. Over the coming months, gradually and very gently, my life began to transform. Meditation was slowing me down. Sitting for 20-minute meditations once a week was allowing me to start to identify the source of my stress. I began to see how stress was like a wild, untrained horse. Before, when the worrying thoughts appeared, I would just jump onto the back of them—and be led for days through dark forests. But Geshe Kelsang Gyatso—the humble Tibetan monk who wrote the book we were studying and who has since become my greatest teacher in life—calls these negative habits of mind “delusions.” They are distorted ways of looking at the world, mistaken projections. We need to learn to recognize these thoughts that lead to suffering, so that when they arise we can let them go, and then cultivate wise and compassionate thoughts that lead to happiness—views that are actually in alignment with reality. 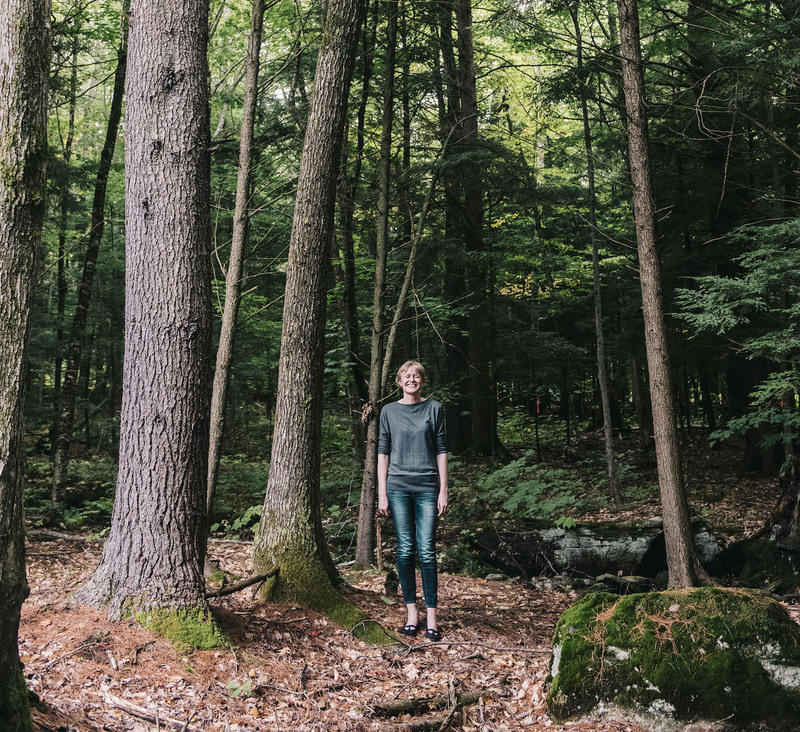 Twelve years later, I have moved halfway around the world to live in Maine. I live in a house in the woods with my Fort Kent-born husband, and I have a full-time job in a content marketing agency working with some of the leading tech firms in Silicon Valley. I spend my days in a fast-paced, deadline-ridden world once again. But with the tools of meditation, everything has changed. It’s not about everything being perfect these days—the job, the relationships, the body I inhabit. Rather, it’s about developing a perfect mind that is free from negativity, and using all these things as my training along the way. My favorite point in the week rolls around every Sunday morning, when I head into Portland to teach a meditation class as a volunteer. I sit down with folks from all walks of life, who wander into the class, take off their shoes and sit down to work with their minds. 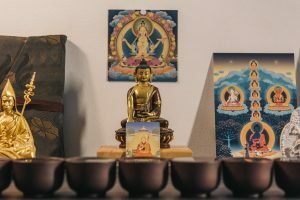 It’s an extraordinary gift to be able to share the same techniques I discovered with Gen Kelsang Tonglam over a decade ago, tried and true methods to help us find our own inner pathways to peace. Clare Tyrrell-Morin is a writer and editor who occasionally blogs at www.claremorin.com. 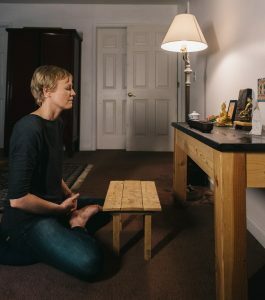 She is a branch teacher with the Serlingpa Meditation Center (www.meditationinmaine.org), and spends her days as the director of client services for Eucalypt (eucalyptmedia.com).